This statistic shows the results of a survey conducted in the United States in February 2017, by gender. U.S. adults that knew at least one pharmaceutical company were asked which pharmaceutical company they preferred when purchasing drugs. About 16 percent of female respondents and 22 percent of male respondents indicated that they prefer Johnson & Johnson when purchasing drugs. What services are you currently receiving to help manage a disease or health issue? In your opinion, how big is the influence of technological improvements on the U.S. pharma industry? In your opinion, how big is the influence of patients and consumers on the U.S. pharma industry? 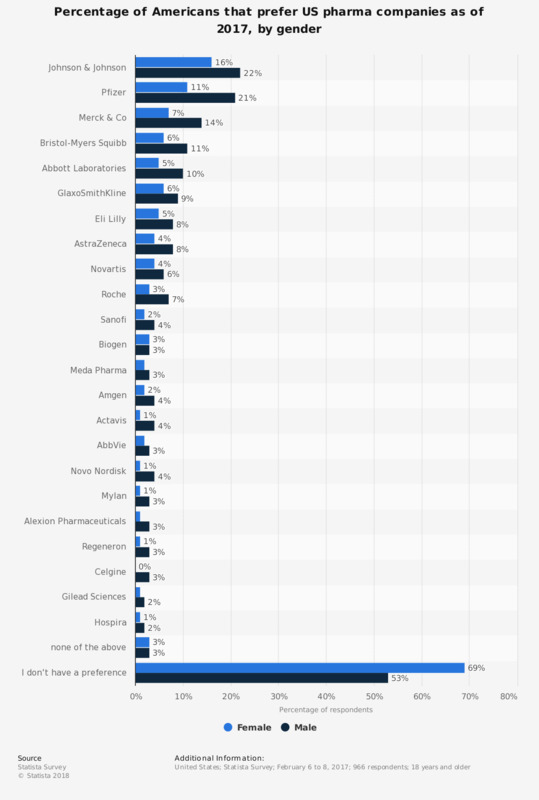 In your opinion, how big is the influence of research results on the U.S. pharma industry?